So I know previously you talked about Cassie on the show “Young Once” and I just recently started watching it. It’s pretty okay. Kind of reminds me of Laguna Beach with a lot less drama & a lot more talk of God. I’m mainly watching it because I saw the trailer for season 2, which airs on Feb 4th, and it kinda looked like Cassie was still with her ex but then breaks it off. My question is have you heard anything about the new season? Have you watched the old season? And what are you overall thoughts of her filming a show with her ex mere weeks before going on the bachelor??? Thanks !!! Comment: Yeah, season 2 started last night. I never watched season 1 and never will. If I get around to watching season 2, I will report on it. However, there’s a good chance I won’t and I’ll just relay what people say who watch it. No, she did not leave that show in a relationship with Caelan because, well, that’d look pretty stupid since 2 weeks later she left to film Colton’s season. But the fact she was filming that show two weeks before she left to film Colton’s season can’t be overlooked. It’s not like she left that show and she told Caelan never talk to her again and she was moving on with her life. That I do know. I am watching today’s episode and feel I’ve just wasted 2 hours. A longtime fan of yours, I’ve kept up with the show but am ready to toss in the towel. NOTHING is genuine anymore and it’s not even mildly entertaining either. It seems the producers really had to work hard to manufacture drama. And all of these girls seem more immature than ever…and total hypocrites, complaining about being badmouthed to Colton after throwing the first stones (e.g, Hannah B and Onyeka -sp?). And it’s really hard to have any feelings towards the mannequin Colton, who can’t act, either. No wonder a real woman, Elyse, left the show when realizing it was ridiculous to think of an engagement without spending the time to know the Bachelor (had she no idea how it worked? )…actually seeming more real than anything else. Thanks for all you do, Steve… you provide the true entertainment from this franchise, as well as the good you do with your more serious podcasts, especially the last one with Craig Robinson. With respect, from Delray Beach, Florida… Maybe you’ll come visit Craig here! Comment: That seems to be a lot of people’s frustrations with the show, so I can’t say I disagree. Look, it’s the same thing every season with different cast members. But the storylines are all based along the same lines we pretty much see every season. People should not be surprised by this. Did we get a ‘to be continued’ due to lack of footage at the end? Comment: No. According to Robert Mills, that was a one shot deal this season, and we’re all caught up next week as we’ll have the Thailand rose ceremony to start next week’s episode, they’ll move on to Vietnam, and they’ll be a rose ceremony to end the episode. This season has been a little bit of a dud to me so far. If it wasn’t for your spoilers I would have a hard time wanting to watch, so thanks. I have a couple questions. 1. Whenever you interview girls from Ben Higgins’ season you usually bring up that it seemed that he liked Lauren Bushnell best early on. I was starting to get those vibes last night with Cassie. Have you heard anything that she was obviously liked the most amongst the girls and they could all tell early on? Yes. It’s why I reported what I did when I did. 2. In a deleted scene Kirpa says she fell taking a selfie in the ocean. What could she be taking a selfie on? I know they don’t have phones. Do they give them cameras? Comment: Didn’t necessarily have to be her phone. Could’ve been one just handed to her by a producer that she used just to take a pic, and give right back. Or it might not even have been a phone. Could’ve been a legit camera a producer gave her for her to take a selfie, and then they’d send that to her closer to when the episode aired. Thanks for all you do, Steve! This is not a “will Elyse be The Bachelorette?” email, even though I think she would be a great one! We will see her in Paradise where she will thrive, fall in love with Blake, and they will have a ton of tall children with great arms hah I have no idea if she’ll be on Paradise. Maybe this franchise was a bit too much for her. That was the impression I got from her exit last night that this wasn’t all it was cracked up to be and/or it was too stressful of an environment for her. Granted, Paradise is much more conducive to meeting someone, but I have no idea where Elyse stands on this. Guess we’ll find out in a couple of months. And if she does, I don’t see her with Blake. But I guess anything can happen. My question: At this point, who do you foresee as The Bachelorette out of the Top 4? I think Tayshia is really setting a great path for herself! She’s creative and appropriately feisty. Caelynn has the sob story. Hannah G just seems like too much of a Barbie Doll with no depth to me. She seems very nice, but there is no substance. Out of these three, I would like to see Tayshia or Caelynn. How about you? Been saying for a while now I’d be real shocked if it wasn’t Caelynn. Has the date been announced for the Women Tell All yet? No. But knowing now the finale is on March 11th, I don’t see how it’s not the week before on the 4th. Do you know if they have had final casting for the guys on the new season yet? Yes. Final casting weekend was the last two weekends. Of course, they can always add people last minute. But the flying guys to LA to interview with producers and get testing done has already happened. Rachel confirmed on a podcast last week that she and Bryan are getting married in August. Will you be sending them a gift? Of course. I stand by my word every season on that. If the final couple ends up getting married, I will buy something off their registry. I can’t wait for Temptation Island! I’m so excited to see everything go down! Comment: We finally saw our first physical cheating of the season last night. Buckle up for what’s to come. Did Colton remain a virgin during the overnights? That I don’t know. But considering he’s really only had eyes for Cassie all season, and the only other woman who gets an overnight is Tayshia, my guess is neither happened. Do you enjoy watching The Bachelor or Bachelorette more? Which do you prefer spoiling? I imagine there’s a difference in the type or quantity of intel you get about male versus female contestants? Comment: There’s not one I prefer spoiling over the other. Spoiling is spoiling to me. As long as I get the spoilers for each season, that’s my main concern. Getting them about one show over the other doesn’t affect me. Just want to get em’. I know your biggest comment on most one-on-ones is how uninteresting they are. They usually lack conversations with substance but always include lots of making out. Do you think it’s just edited to be that way because the audience wants to see a physical connection? Like, do you think they might actually have meaningful conversations that just don’t make the final editing cut? I’d imagine if the dates were really that uninteresting, most of these girls just wouldn’t make it very far. Well there’s obviously way more to the date than we ever see. But since we don’t see it, it’s hard to comment on that part. I’ve known about Cassie winning since you spoiled it, but I find it interesting that they really haven’t given her thaaat much airtime, but all of the girls seem to be fully aware she’s the front-runner. 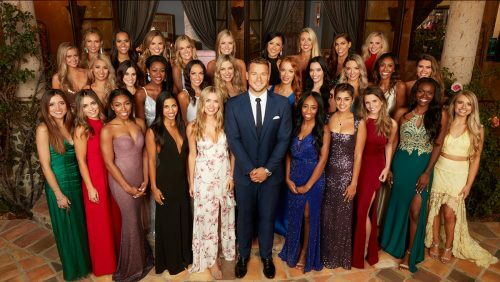 I wish they’d give a little less fake, producer-driven drama and more of him making connections with these women. Isn’t that literally the point of the show? Ha. This is talked about in tomorrow’s podcast with EW’s Kristen Baldwin. That whole Onyeka/Nicole thing was annoying. I actually like Onyeka, though! Such a shame she took the producer bait; hope she’s on BIP. And Nicole is a crybaby and a little annoying, quite frankly; hope she’s not on BIP. Does anyone know if he ever got back to Katie after he left her there when he went to listen to Onyeka and Nicole. I would expect both of them to be on BIP. And Katie too. No idea if he ever went back to Katie. Lastly, you made a comment last week on a reader email that Arie went into the bachelor with the wrong intentions, but might have come out with different ones. After seeing how Arie and Lauren’s relationship has unfolded over the past year, do you think they’ll make it? Or at least last for a while? Thanks for all your feedback—I LIVE for your blog! Comment: With a child on the way, lets hope they do. Maybe it’s because I haven’t watched The Bachelor in a while (I skipped Arie’s season) but I was surprised by how many different combinations there has been this season of two women getting into arguments. I thought the usual format is two people butting heads the whole season and then the issue dies on the 2-on-1 and maybe one other small argument. This season we have had Onyeka vs. Catherine, Demi vs. Tracy, Caelynn vs. Hannah, Demi vs. Courtney, and now Onyeka vs. Nicole. A lot of these arguments seemed instigated by the producers. Have you picked up on that this season (the multiple cases or am I just forgetting how this show operates?) It seems like Colton lacks a connection (except with Cassie) and conversational skills (including Cassie) with the girls so they need something to fill the episodes with. Comment: It’s pretty much all I’ve talked about in my recaps all season. Guess you must’ve missed that.